The City of Zion has implemented an Ordinance requiring the recycle/diversion/repurpose of debris created by construction and demolition projects. The following are the highlights of Ordinance 74-82. 1. 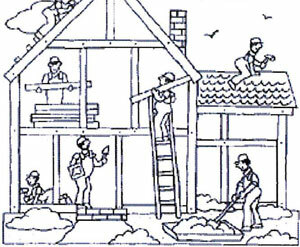 Projects affected by this ordinance include any building construction, renovation or demolition activity that includes without limitation , either (a) the construction of a new principal structure; (b) the demolition of a principal structure or accessory structure; or (c) renovation and/or addition of more than 1000 square feet. For projects not meeting these requirements the City still encourages you to consider these alternate disposal methods. 2. For all projects covered by this Ordinance the following are the percentage of debris that must be diverted. a. Permit Applications submitted from June 1, 2013 through December 31, 2013, at least 50% of construction and Demolition debris must be diverted. b. For all projects covered by this Ordinance submitted on or after January 1, 2014 at least 75% of construction and demolition debris must be diverted. 3. Immediate or emergency demolitions are exempt from the recycle requirement. 4. When submitting for a permit on a covered project, the applicant will receive forms that must be completed and submitted back to the City showing the amount of debris that was recycled. 5. Not less than five business days prior to the scheduled date for the final inspection, the applicant shall submit to the Director a confirmation from their Recycling Agent that the material required to be recycled was in fact recycled and such additional information as the Director may require. The information required shall include actual weight of C&D debris that was generated and actual weight of debris diverted/recycled/repurposed. 6. Occupancy will not be allowed for any property on which a covered project has been completed that has failed to provide the required documentation and/or the applicant pays all penalties imposed for any violation of this article. 7. Exceptions will be considered by the applicant completing a “Request for Exception” Form. 8. Violations of this Article will result in penalties in the amount of $500 for the first offense, $1,000 for the second offense, and $2,500 for the third and subsequent offenses. What is general construction and demolition debris? What is clean C&D debris (CCDD)? Uncontaminated soil (mixed with other clean C&D debris) generated from construction or demolition activities. Since 2005, there have been several changes to the roles concerning CCDD, which are spelled out on the Changes to Clean Construction or Demolition Debris (CCDD) Requirements page. Why is C&D debris a problem? Landfills are filling up with C&D and other wastes, and some landfills will close in the near future; therefore, it is wise to find other alternatives other than landfilling C&D debris. In addition, illegal dumping of C&D debris can result in future health risks, decreased property values, and cleanup costs. Proper management and reduction of the amount of C&D waste you generate can save money, conserve resources, and preserve the environment. There are options of different companies you can use for recycling of this material in Lake and Kenosha Counties. Zion is fortunate to have one located in town to make the process easy. We also encourage you to contact Lake County Habitat for Humanity to see if they would have an interest in your bathroom fixtures, kitchen sinks, vanities, kitchen cabinets, etc. For recyclable materials You have the option of taking it by the car/truck load or dumpster. When hiring a dumpster company make sure they are aware of the requirement to recycle and provide you with all the receipts showing tonnage. This company provides dumpsters; full recycle service and drop off service. They take donations of furniture, working appliances, building materials, fixtures, sinks, vanities, etc. Do what’s right for our future generations and recycle and repurpose.